Anna Koch working on what she describes as "awesome" power systems models at Brown and Caldwell in Seattle. When Anna Koch started college she was determined that she would not be an electrical engineer. Four years later, she has received the prestigious Institute of Electrical Engineering (IEEE) scholarship in power and energy engineering — the first Oregon State University student to do so. Koch wanted to forge her own path, rather than follow in the footsteps of her father (an electrical engineer). But once she started taking classes she was drawn in by the mathematical challenges of electrical engineering, and particularly power systems. “I like looking at the broader picture — how electricity is flowing into Corvallis, for example, instead of on the electron scale,” Koch says. Eduardo Cotilla-Sanchez, assistant professor of electrical and computer engineering, noticed Koch’s math aptitude in his class, and invited her to be part of a research project to bring a smart grid to Oregon State’s campus. 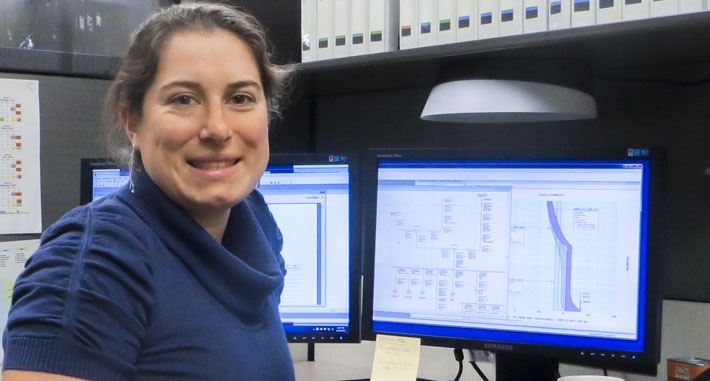 She worked on the preliminary phase of the project, assessing the current state of the grid and presenting her findings to the Oregon Department of Energy, Oregon State faculty and industry representatives. “She has a great ability to connect the math behind power systems with big picture energy problems that we face in Oregon, the U.S. and internationally,” Cotilla-Sanchez says. Koch says power systems are definitely in her future. She has been doing her internship with Brown and Caldwell, an engineering consulting firm focused on water and environment sectors. As part of the electrical power systems group she has been working on water and wastewater treatment facilities. “It’s been very cool because I’ve been able to do design work and apply what I’ve learned in my classes. I like working with a company that has an environmental focus because that’s an important part of engineering in today’s world,” Koch says. The IEEE Power and Energy Society selected 228 high-achieving students from across the U.S. and Canada this year for the scholarship. The award will help Koch pay for her last few terms of tuition which was a welcome relief since she is from New Mexico and pays out-of-state tuition. “I was very excited to get the award. IEEE is the gold standard, and to be recognized by professionals in the field is really encouraging,” she says.